Nuclear Emergency! Are you ready? 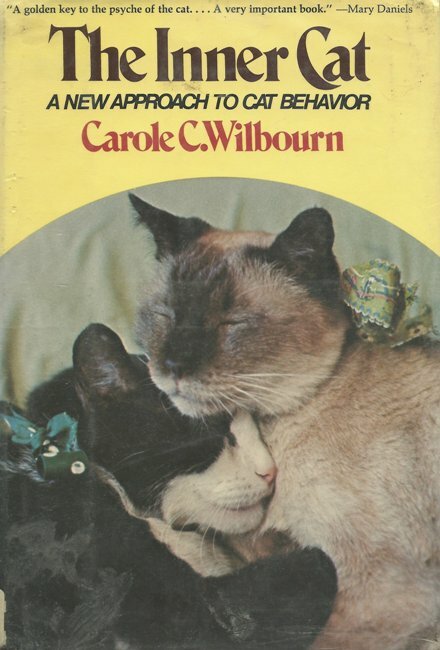 Submitter: If you thought “Why Cats Paint” qualified for Awful Library Book status, I give you its sequel “Dancing with Cats!” And yes, we had both of them on the shelves of our medium-sized Midwestern public library. 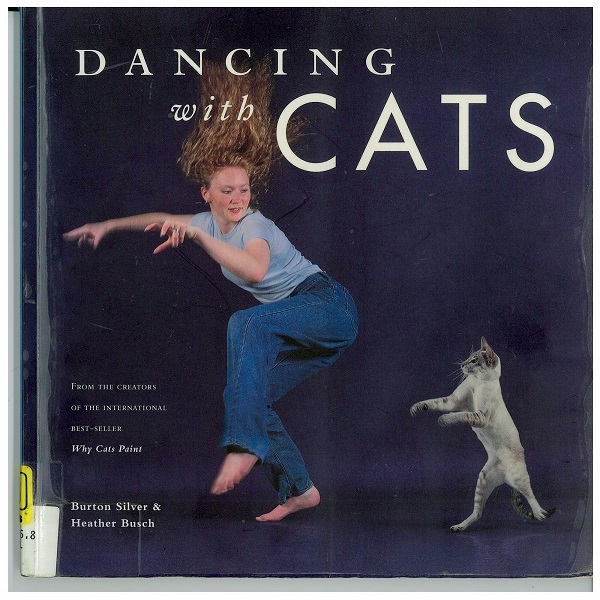 Unlike it’s hilarious predecessor, Dancing with Cats is kind of creepy and the images will be burned into your retinas forever, mainly because of the humans in the photos. Take Fred in his body paint, leotard and tail (Oh Lord, please let it be a leotard!). Or Ivan in his Speedo. Doesn’t it look like the cats are begging him to put some clothes on? Ralph simply looks possessed, while Helen in her tie-dye looks like she’s been into the catnip a few too many times. I will say however, that the models in this book could teach Tyra Banks’ protégés on America’s Next Top Model about committing to their poses. Not that I watch ANTM. Much. This book is good for a novelty, but like many humor books, the novelty wears off pretty quickly. It hasn’t circulated in a few years, so we’re pulling it from our shelves. Holly: Is it a parody? Is it serious? We’re not sure. 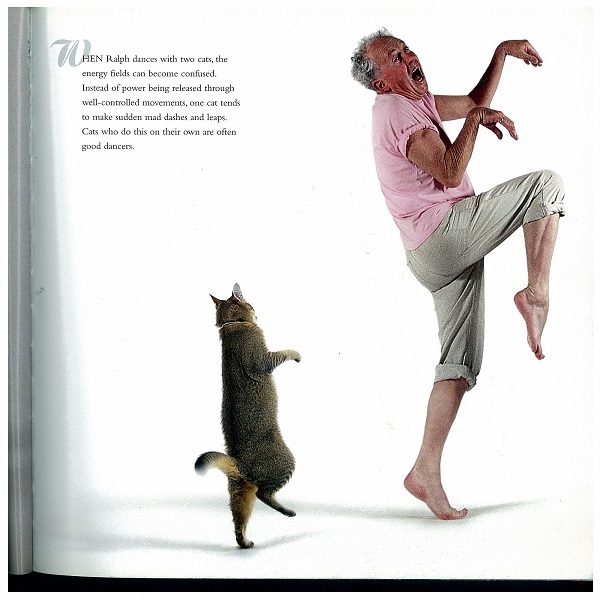 Worldcat’s summary seems pretty serious: “Photographs and text celebrate the joyous communication that can exist between humans and their feline companions as they engage in movement and dance together.” The Library of Congress in their wisdom gave it serious subject headings, too: Dance, Cats–Behavior, and Human-animal relationships. Either way, it’s funny! The cats are…dancing! Mary, can Roberta dance? It’s the people who are really funny here, though. I’m a little worried for Ralph, actually. He might be having a stroke. Next Post:Nuclear Emergency! Are you ready? What a waste of a good tree. 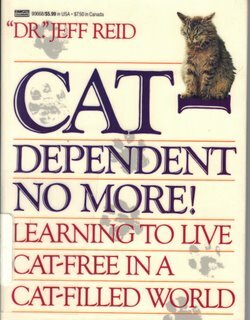 My cat fiend daughter, Liz, says this is a book she desperately needs. She thought it was fantastic. I may have to buy this for her stocking this year. Definitely a leotard! *whew* The toes are squinched together. Dear God. Marvin and his feline buddy appear to be falling out of a plane. 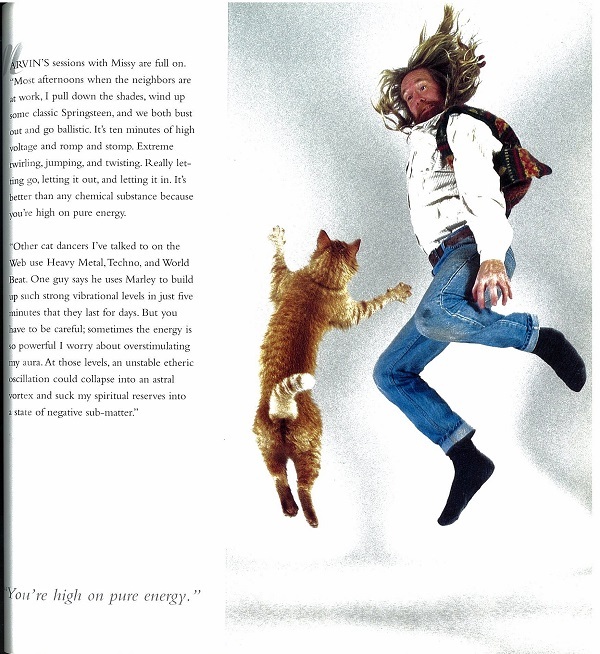 Also, did anyone read that bit about overstimulating the aura as a result of too much cat dancing? It makes even less sense than the rest of this book. Also, yeah, someone call the home; Ralph’s escaped again. Of course it’s a parody. Yeesh, people. You’re not sure? Seriously?? 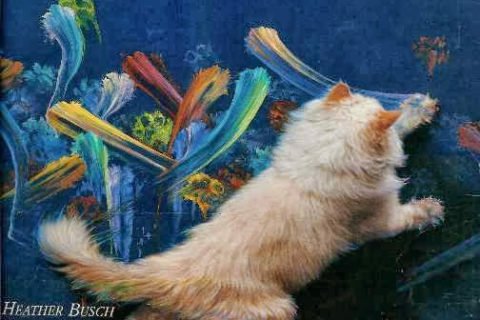 I haven’t read this one, but happen to think that “Why Cats Paint” and its successor “Why Paint Cats” were both a hoot. yes. it’s a parody. I know we all wish it was real. but it’s not. a website. I wonder if they have end of year recitals that you and your cat participate in. I saw the (I hope there is just the one!) site! 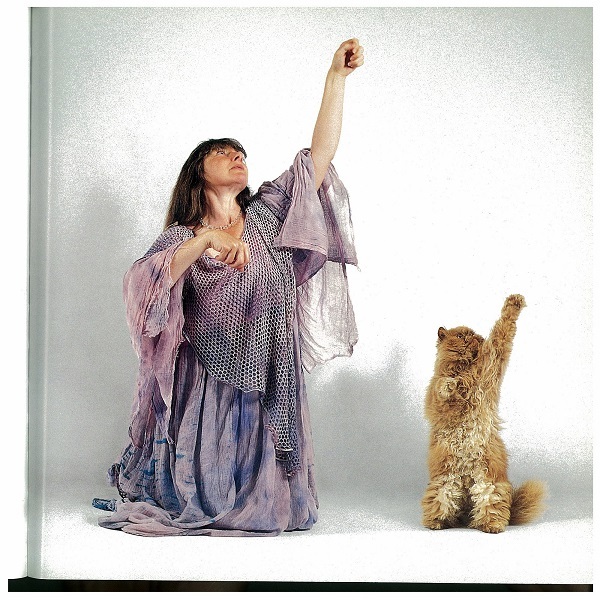 I see the participating people need to bring a stuffed cat (toy) cat or “life-sized bendable model!” So, while the book may be parody (the painting one is more obviously so), there are those who do dance with their cats. I can see cats chasing after the long swirly skirts in the photos on the site. My kitten would. 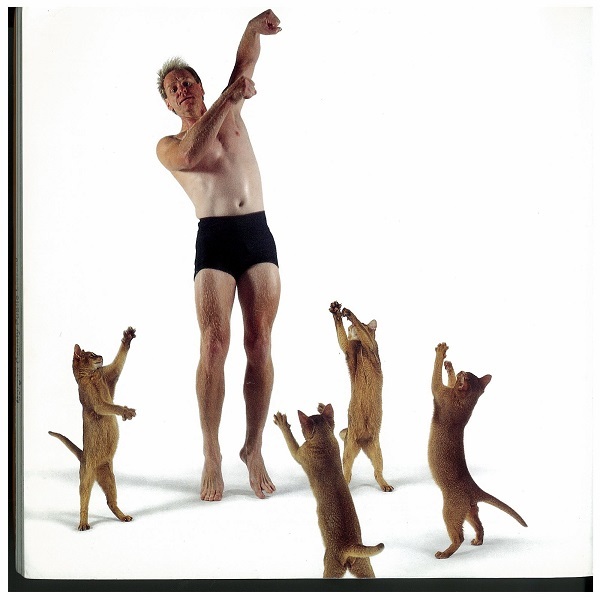 I guess cat people didn’t want to be outdone by the dog dancing crowd. After all, a dog/woman team won Britain’s Got Talent last year. The “trained” cats don’t fair so well. 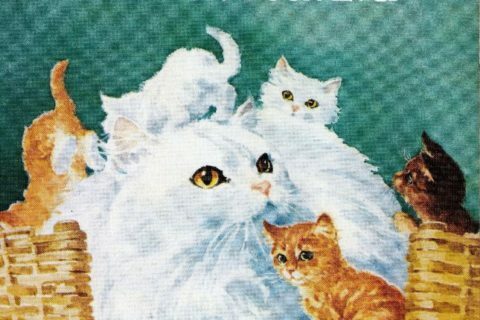 So, you’re no longer the Library that Loved Cat Dancing? That book is, frankly, just stupid. Good grief. I’m embarrassed for the human race. i think i have to agree with Mary Ann…some poor tree gave up its life to print this? It got a 3.9/5 rating on Goodreads. It’s hard to believe so many people spent that much time looking at it. Either that, or its been perused for weeding by librarians all over the world. His Bogor cartoons, about a lonely NZ lumberjack and his hedgehog companion/nemesis are funny and touching. I’m not sure if humourous books count as awful, humour is very subjective, unlike out-of-date information. I just requested this via interlibrary loan for a good laugh. Thank you!